Coil mounting bracket- or plunger guide- for use on most standard coils in many Williams games. May also be used in other makes/models. 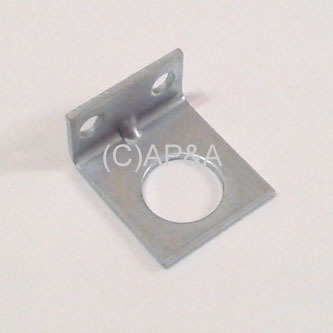 Has two #8 size screw mounting holes which are NOT threaded, and spaced 5/8-inch apart, center-to-center. Large hole for coil sleeve measures 17/32-inch diameter and is 3/8-inch from bottom of bracket.